Jaimie has an album that contains photos of her family, dating back over 100 years. 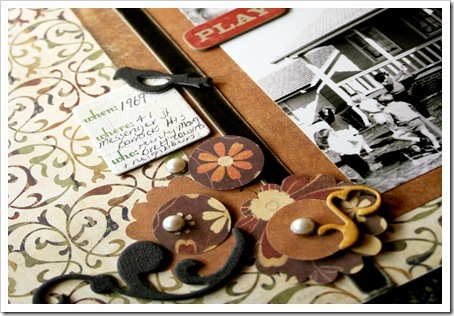 She says this album has been waiting for her to scrap the history of her family but she has never found the right paper range that would carry it off - that was until Paperloft brought out their latest three ranges. 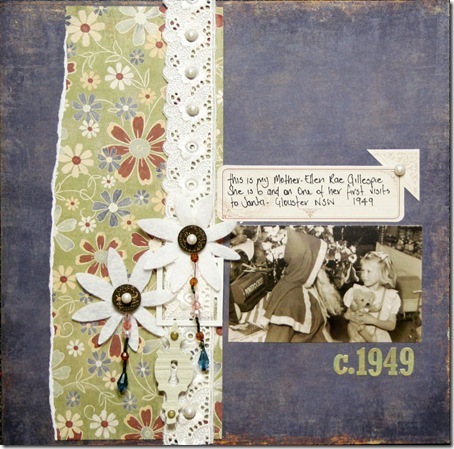 In this LO Jaimie has used Spring Fling to create this page about her Mothers first visit to Santa in 1949. Subtle yet feminine, she has added felt flowers and centred them with vintage buttons (from ebay! ), beading and brads. 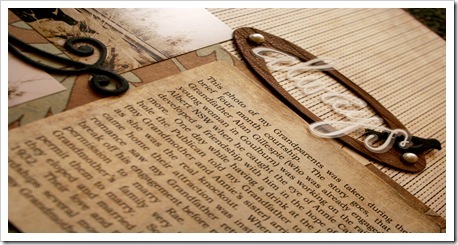 The Grungeboard keyhole was crackled in keeping with the vintage theme and handwritten journaling on the Sharon Ann timeless journaling piece keep the page subtle and charming. 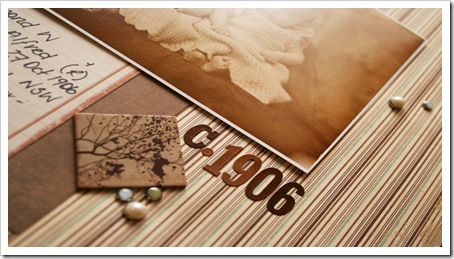 Simple layering of both the Now & Then and Grandmas house ranges from Paperloft was all this LO needed. Jaimie wanted the focus to be on her photos of her Grandparents and the story that went with them. 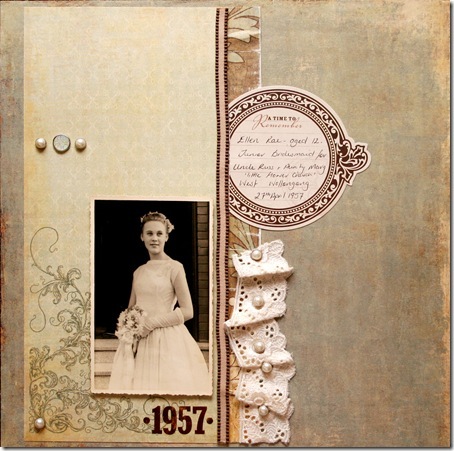 Crackled Grungeboard, brads and chipboard embellishments are all that were needed for her page. With such a small photo of her mother, Jaimie intentionally kept this page clean and simple. 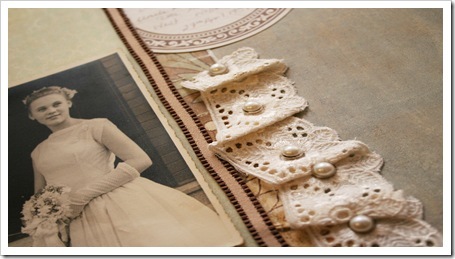 Embellishments were kept to a minimum with feminine lace ribbon, pearl brads and simple journaling so as not to overpower her photo. The original of this photo is over 100 years old - so after the painstaking task of cleaning up and repairing the ravishes of time, Jaimie enlarged this photo of her Grandfather and his twin brother so it would not be lost on the LO. More simple blocking of paper with ribbon and brads added for balance, Jaimie has created yet another lovely heritage page for her album. 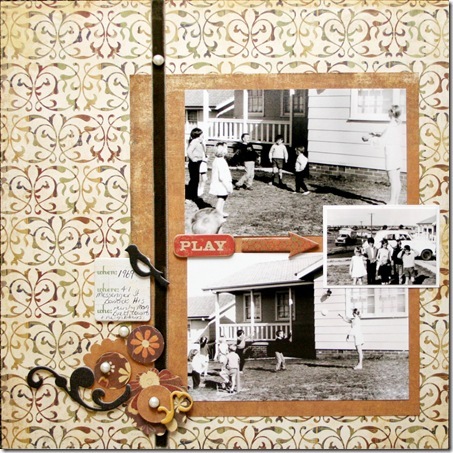 Simple clustered embellishments with chipboard accents added for depth, keep this page simple but still interesting with focus still remaining on the photos of her family and neighbours at play out the front of their newly moved into home. Janine Kaye has created two gorgeous LOs showcasing not only the Paperloft product but also her simple yet unique style and her stunning photography. 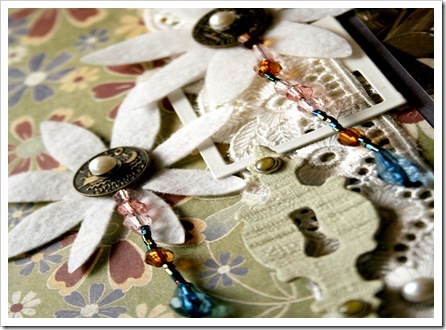 By cutting the heart & circle patterns from the paper she has created lovely yet simple embellishements that lead your eye through her page ensuring you dont miss a thing. 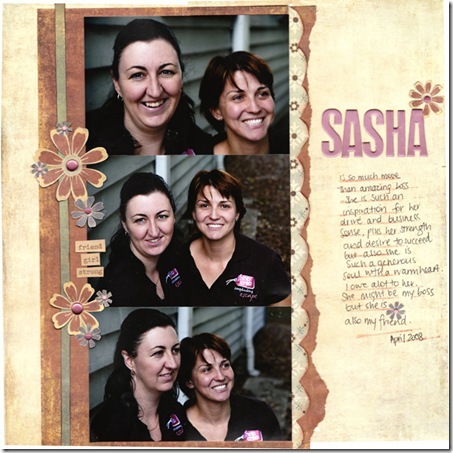 Another stunning page that again showcases Janines photos - paper tearing and freestyle cutting of the paperloft paper create a sweet background to her page and her handcut flower accents are the 'just enough' embellishments for her page. 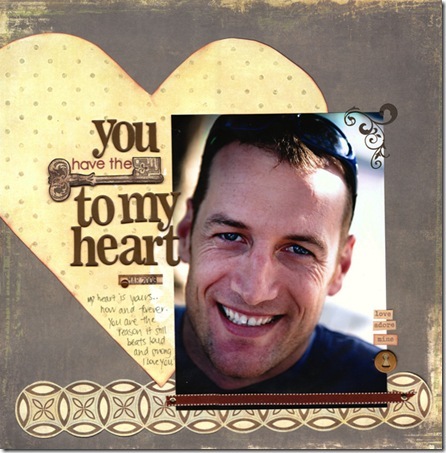 Simple and heartfelt journaling finish off this LO.